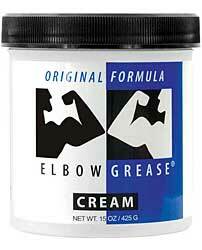 There’s a reason that Elbow Grease is the oldest personal lubricant on the market – this best selling formula has been a favorite for years and continues to be a best seller today. Designed specifically to enhance your sexual experience, you can trust this mineral oil based thick cream to be the long-lasting, safe answer to all your personal needs. The classic tub packaging includes 15 oz. of premium cream.